AAAnimal Control does not use poison. Poison poses a threat to your household, the environment, and worst of all, it leaves dead rats and mice in the walls. 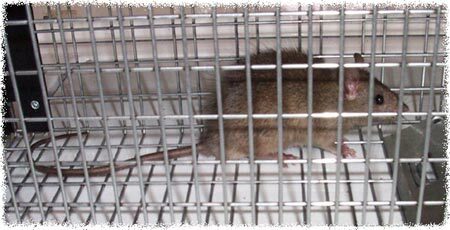 I use integrated pest management, which means that I trap existing animals, seal up areas where rats and mice enter, use one-way doors if possible, modify habitat so that your home is less appealing to them. I believe that this is the best approach. I see pest control companies and other Orlando exterminators charging an arm and a leg to spread some poison outside the home. That is absolutely ridiculous and lazy, and doesn't solve anything. Mouse info: The house mouse weighs less than an ounce. It can fit in a crack of only a quarter inch. They can and do get everywhere. If your house has food and has any small openings, eventually mice will find their way in. House mice eat many types of food but prefer seeds and grain. They do not hesitate to sample new foods, sampling many kinds of items in their environment. Foods high in fat, protein, or sugar may be preferred even when grain and seed also are present. A single mouse can't eat a whole lot, but because of their habit of nibbling on many foods, discarding partially eaten items, and defecating everywhere, mice destroy considerably more food than they consume. Mice are primarily nocturnal, they can dig, they chew like all rodents do, and they can produce a tremendous number of offspring. Click for my rat removal photo gallery. Click for examples of rat removal jobs I've done! Nuisance concerns: They chew on wires and anything else they can get their teeth on. They eat your food and contaminate it. They leave droppings in the attic and everywhere. They spread filth and pestilence. They once killed a third of Europe's people ...that's the equivalent of at least a dozen Americans. Some examples of rat diseases that can be spread by rodents are Salmonellosis (acute food poisoning), Rickettsia Pox, Hantavirus (via droppings), tapeworm, infectious jaundice, and tularemia. I highly recommend attic decontamination services if you've had rats living in your attic. Check out my Orlando rodent control page for more information on our permanent rat control techniques. We also deal with mouse problems, which you can read about on my Orlando mouse control and mice trapping page, but the truth is that mice are far less common than rats in central Florida. AAAnimal Control will combat that rat and put mice on ice! Click here for rat & mice job prices. Click here for photos of rats trapped on power lines in the attic. Click here for photos of rats chewing on power lines and pipes. Click here for photos of rat droppings in attics. Click here for information on rat diseases. AAAnimal Control specializes in rat removal. Although we deal with all kinds of wildlife, rats are often the most challenging animal that we deal with, due to their amazing climbing capacity and ability to squeeze through small openings. We are not like the other Orlando exterminators or exterminating companies. They want to sign you to a monthly contract - they don't want to permanently solve your problem. The only way to keep the rats out of your home and attic for good is by finding and sealing (with steel) all of the entry points that rats use. This requires a lot of experience and rat study. The rats that we deal with 100% of the time here in Orlando are actually the Roof Rats. 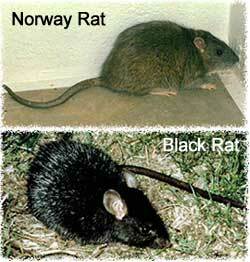 They like the sub-tropical environment, as opposed to the Norway Rats, which are more abundant up north. Roof Rats are amazing climbers, and they love to lie in attics. Inspecting your home, finding all of the holes the rats use, sealing those holes up, and trapping and removing ALL of the rats, without leaving any dead odor-causing bodies behind, is what we specialize in. Please visit our dedicate Orlando Rat Control website, www.OrlandoRats.com for more information. If you need help in the Tampa Bay area, click here for Tampa rat control.